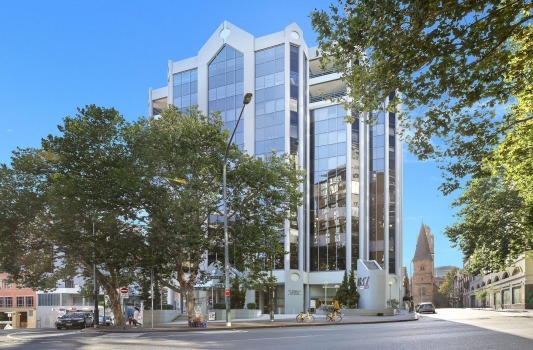 Adelaide-based developer Greaton Group has acquired a fully-leased office building in Sydney’s Haymarket for $145.8 million. The sale of 187 Thomas Street Haymarket reflects a low passing yield of 2.98 per cent, although it is understood that the developer valued the building’s proximity to Central Station, which is set to undergo a major revitalisation. The vendor was trade union United Voice. Chinese-backed Greaton is likely to build an apartment tower on the site which will add to its $1.3 billion portfolio of projects in Sydney and Adelaide. The developer has the $260 million Oxford Central complex under way in Sydney’s Epping which will consist of 252 luxury apartments, with most already sold. Greaton is building Sydney Darling Harbour’s $730m hotel complex “The Ribbon” with Grocon — and is diversifying its interests amid falling house prices. The developer has also lodged plans to build Adelaide’s “first five-star” hotel at Victoria Square, according to the Australian Financial Review. It is also developing Adelaide’s largest apartment project, the $300 million West Franklin apartments, which will comprise 560 apartments developed in stages. Bennett Wulff and Ashleigh Haltiner of Charter Keck Cramer acted as transaction advisors to United Voice on the Haymarket sale with Vince Kernahan, Steam Leung, Guillaume Volz and Tom O’Neill of Colliers International the appointed selling agents. Competition for the building was hot with 23 expressions of interest received by close with the sale finalised within two weeks. The 2351sq m site at the cross-section of Valentine and Quay Streets would offer 23,275sq m in gross floor area for Greaton based on permissible floor-space ratio. United Voice’s NSW branch will remain in occupation on a 12-month leaseback while a new premises is identified, with the additional flexibility of two six-month options. InterContinental Hotels Group will be bringing its boutique Indigo brand to Haymarket when it opens Hotel Indigo Sydney Central in 2021 at Parker Street with Sydney property developer Watson Elite.